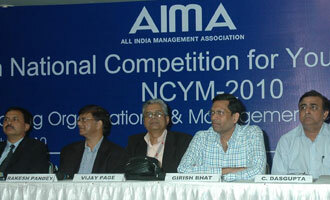 The All India Management Association (AIMA) has been annually organising the National Competition for Young Managers. The competition provides a unique platform to young managers to exhibit their talent and leadership skills. MET League of Colleges was the academic partner and venue host for the AIMA’s 36th National Competition for Young Managers (NCYM) Competition on ‘Managing Organizational & Management Challenges in India’ on July 16 & 17, 2010 at the MET Convention Centre.